You know that welcome time that seems to happen every winter, when the frigid cold seems to pause for a moment and grant us a brief reprieve, giving us time to catch our breath – sometimes known around here as the January thaw? 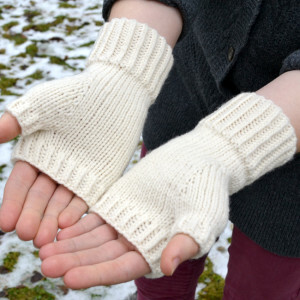 Inspired by this magical reprieve, Midwinter Stroll Mitts are designed to take advantage of this time when your heavier mittens aren’t needed. A short length and glove snug fit ensures that these mitts will allow lots of freedom of movement – great for taking pictures on a midwinter hike or for simply hugging your coffee mug. If you love the look of the mitts, but crave a longer length and more finger/thumb coverage, no worries, instructions are given for altering the length! A trio of cables starts at the cuff and wends its way up the entire length of the mitt. Left and right mitts are mirror images of one another so the cables twist outward on each mitt. The pattern is graded for three sizes, so Midwinter Stroll Mitts will fit hand sizes of approximately 6.5, 7.25, 8”(16.5, 18.5, 20.5 cm) palm circumferences. 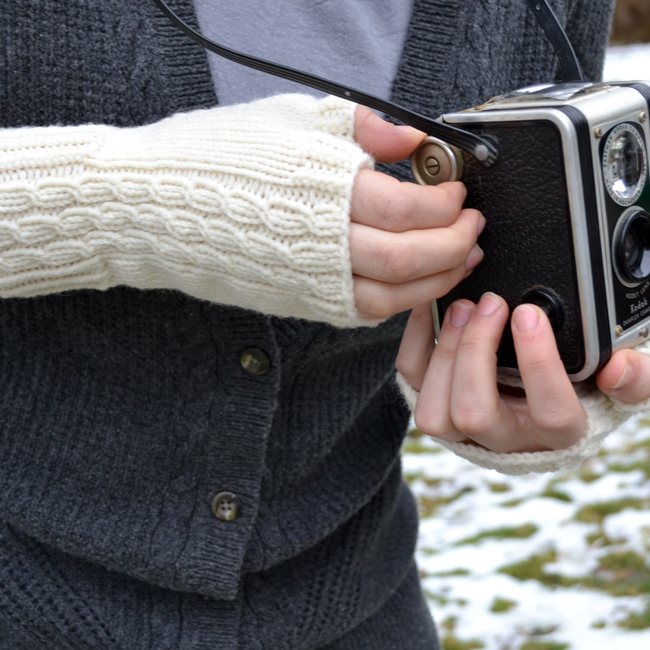 The sample is worked in cushy Quince & Co. Lark worsted weight yarn, in the colorway, Egret. Lark is a domestically sourced yarn that is 100% wool, so it is nice and toasty warm. The cable stitch pattern is charted, but the pattern also features complete written line by line instructions so the ability to read a chart is not necessary to work this pattern. I designed these mitts as I did my own midwinter stroll last winter. They are quickly knit, so in a night or two of knitting, you will be ready to get outdoors with your own camera – vintage or otherwise – and capture a bit of nature’s beauty. 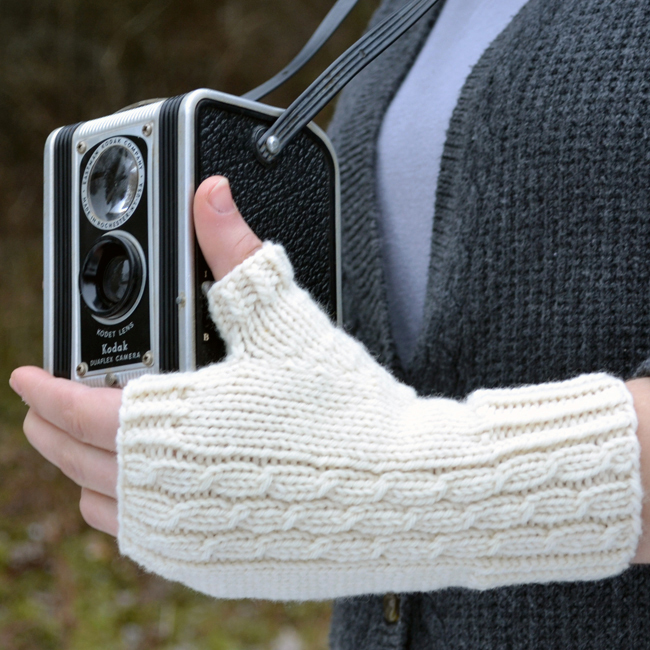 Full pattern details for the Midwinter Stroll Mitts can be found here.